This was my first river cruise and it was going to be a long one. To be exact, 28 days with Uniworld on the Danube, Main and Rhine rivers. I hoped I’d like it. Aptly named the Grand European Serenade, my river ship, the River Duchess is at home cruising between two seas; the Black Sea and the North Sea. From Romania, the Duchess cruises north on the Danube, gradually ascending through a series of brilliantly engineered locks to an elevation of 1,332 feet above sea level. At that point it’s all down hill from there. Completed in 1992 linking three great rivers of Europe, the Rhine/Main/Danube canal leads into the Rhine river for a slow descent towards Amsterdam and the North Sea. It is a journey of twenty-four days and over 2,500 miles. A two-hour motor coach drive from our hotel in Bucharest brought us to the port of Giurgiu, Romania and the awaiting River Duchess. Humming the melody and remembering the words to Strauss’s Blue Danube waltz, I made my way towards our boat. Unbeknownst to me, I was walking next to the ship’s doctor. I must have looked incredibly tired when he turned to me and said in a deeply-accented voice, “I’ll help you with your suitcase.” I gladly handed over my overweight carry-on bag. He wheeled it the rest of the way down the sidewalk, through the gangway and onto the boat. This would not have happened on an ocean-going vessel where, if you’re lucky, you don’t have an opportunity to meet the ship’s doctor. As you step onboard, the difference between a river boat and a cruise ship is quite apparent. Don’t get me wrong, I love ocean cruising and have been doing so for over four decades. The European staff and crew were precisely queued in the reception area welcoming each of us individually, as we entered. Then the most extraordinary thing happened. Checking in at Reception to get my room keycard, no one asked for my credit card. Imagine – not having to hand over your credit card to receive your room keycard. Instead, you are politely asked to stop by at your leisure to present your credit card. When almost everything is included in your cruise fare, from shore excursions to wine at dinner, no one seems concerned about an errant onboard account. Including the Captain, there were only thirty-six crew members onboard. The ship’s officers hailed from northern Europe while the dining room, galley, room attendants and hotel staff were mostly from eastern Europe. Captain Frank was Dutch as was the Hotel Manager, Joke (pronounced yo-kah.) Our Cruise Manager, Rik, was also from the Netherlands. An interesting twist on river cruising is that the Cruise Director (called the Cruise Manager) is an independent contractor and as such, moves from ship to ship…usually within the same fleet. Within a couple of days, the officers and staff knew almost all of the passengers by name. It was nice to pass the Reception Desk and have the person behind the counter chime out, “Have a nice day, Ms. Laskin.” After only a couple of more days, you know most of your fellow passengers by name, too. With only three decks and an expansive sun deck, it is easy to learn your way around the River Duchess. The larger public rooms are the dining room and panoramic main lounge with its cozy bar. Tucked neatly away and cleverly using every inch of space, are the Captain’s Lounge and library, a 24-hour self-serve coffee, tea and cappuccino station, internet corner with two computers, self-service laundry facility, fitness room, boutique and the Sky Lounge with a sliding glass roof. Depending upon weather, several times during the cruise the Sky Lounge is transformed into a beautiful al fresco dining area complete with table cloths and faux candles. Imagine sitting outdoors enjoying a continental lunch or dinner where, aside from wonderful conversation with new friends, all you hear is the melodic sound of the river as it laps against the side of the boat. In contrast to the astronomical internet fees charged by the ocean cruise lines, the cost for internet on this twenty-four day voyage was a mere $35 USD. Though not always perfect and similarly as slow as their ocean-going counterparts, the wifi connection was admirable, considering our location. There are also six bicycles for loan by simply requesting one at the front desk. The 137 staterooms and suites occupy the first three decks, interspersed with the smaller public rooms on the first two decks. The third deck has larger staterooms and suites, with doors that open or slide to reveal a French balcony. I thoroughly appreciated being able to open my sliding door and gaze at the scenery. It was a moveable feast for my senses; the springtime chirping and chattering of birds, the spicy smell of pine tree forests and silver-blue color of the Danube at sunset. Similar to having a balcony on a cruise ship, it’s difficult to go back to just a window. Each nicely furnished stateroom includes a vanity, generous built-in closets, hair dryer, safe and telephone. Individually controlled air conditioning and heating, flat screen televisions with satellite reception and select movies add to the upscale ambiance. The bathrooms are equipped with a magnifying mirror, plush bathrobes and fabulous French L’Occitane bath and body products. The four suites have sliding doors to access a wide French balcony and include an espresso coffee maker, bottle of wine, daily fruit basket, morning coffee and the best amenity by far – complimentary laundry service. With velvety-soft high-count cotton sheets and cashmere blankets, you may just want to stay in bed and watch as the breathtaking scenery passes by your window. 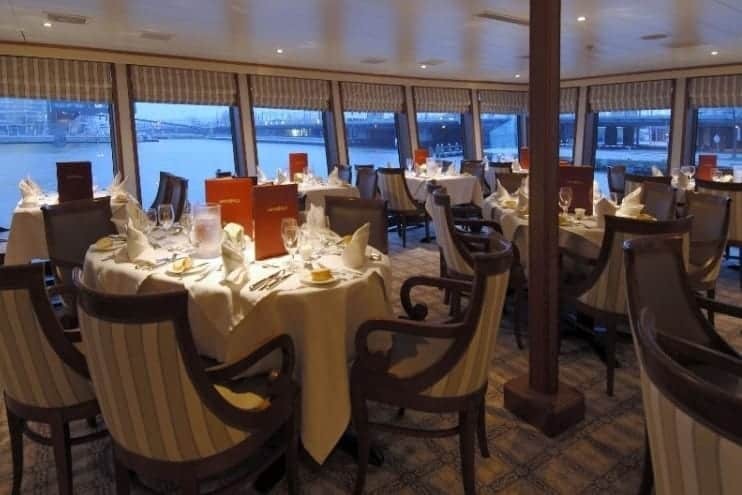 Unlike cruise ships where dining time seems like an endless mélange of food, the River Duchess has fixed dining times. The main dining room offers buffet-style breakfast and lunch with waiter service for beverages. Breakfast features an omelet station, a beautiful variety of cheese and cold fish, incredible home-made yoghurt and a wide assortment of cereals and fresh fruit. A particularly nice touch, especially for devout coffee lovers are individual French press coffee makers. Dinner time, usually between 7 – 9pm, is table service only. Most guests arrive promptly at 7pm, especially if they and their new friends want to get a table for six or eight so they can all sit together. You don’t have to arrive exactly at 7pm, but be prepared to sit where space is available rather than choosing your favorite space. No matter where you sit, there is always a great view from the panoramic windows. With a small galley and only six assistants, it is fascinating how the chef can create such wonderful and distinctly different meals. Another advantage to river cruising is that the chef prepares dishes using locally obtained fresh fruits and vegetables. Some of the excellent dinner entrees were roast duck with Grand Marnier sauce, broiled Red sea bass with assorted vegetables and fresh dill and a vegetable strudel in a light-as-air puff pastry served on tarragon sauce with cherry tomatoes. Starters included a delightful smoked fish mousse, tender broiled baby scallops “Rockefeller” served on leaf spinach tossed with a light Hollandaise sauce and thinly-sliced crispy bruscetta con pomodore with Parma ham and olive oil. Enjoy complimentary wine or beer with dinner as you savor traditional culinary highlights; lightly spiced Hungarian goulash in Budapest, Hungary, thinly breaded Weiner Schnitzel in Vienna, Austria or Würsburger Sauer Braten with red wine sauce in, of course, Würsburg, Germany. Should someone prefer more “American” fare, there is always the familiar standby of broiled chicken, salmon or steak. Your waiter, attentive and eager to please, makes sure that you enjoy your time in the dining room. No one ever left hungry or complaining on this cruise. In fact, even the ala carte steak, usually an “iffy” choice on mass market cruise lines, was subject to glowing reviews. As you cruise northbound on the Danube from Bucharest the experience is truly a window into living history. Still recovering from the turbulent 1989 revolution and a civil war barely ending ten years ago, eastern Europe is a region in extreme transition and transformation. Stops at war-torn Kostolac, Serbia and Osijek and Vukovar, Croatia, impart an up-close and personal glimpse as to how resilient these people are in the recovery process of their lives, homes and communities. Danube encroaching on steps and landing in Vukovar, Croatia. Water rising…note to self. Every evening before dinner, Rik, our cruise manager, gave an informative fifteen minute talk about the next day’s destination and a description of the included shore excursion. Taking into account that European cities and towns are hundreds if not over a thousand years old, many of the streets leading into or through town are still the original cobblestone. Thus, some elderly or mobility-impaired guests chose to remain onboard. The majority of us would depart for the day’s excursion via motor coach but there were always a few passengers who chose to stay onboard. Soon after our coach left the dock area, the River Duchess would also leave and head for another destination a few hours up-river. Those who stayed onboard were treated to lovely vistas, a quiet lunch and a couple of hours at the next port should they decide to go ashore. At the end of our excursion, the motor coach simply drove in a new direction to catch up to the boat. Whether on a walking tour or taking a motor coach to a more inland destination, everyone receives a “gadget.” It’s actually a radio receiver on a cord which is worn around your neck with a small earpiece attached (yes, you keep your own earpiece throughout your voyage!) No more worrying about wandering off to get a longer glimpse at a 2,000 year old artifact and losing your group. The radio reception range is fairly strong and you can hear your tour guide’s voice increasing in sound as you near your group. Our tour guides were excellently trained and extremely knowledgeable and proud of their country and spoke very clear English. The cruise manager travel with the passengers on the motor coach and walking tours, which imparts a feeling of security, comfort and concern for their guests. As medical facilities along the Danube are few and far between, if at all, the ship’s doctor accompanies every cruise on the lower Danube between Bucharest and Vienna. The doctor also accompanied us on all the lower Danube shore excursions. A highlight of one shore excursion in Serbia included a visit to Belogradchik Fortress. Situated at the top of a very steep and rock-covered hill, this medieval fortress looked more like an Indiana Jones movie set than a real fortress. Everyone was determined to attempt the climb. With a defibrillator case in hand, the doctor followed our single-file line all the way to the top. Should someone go into cardiac distress, he was prepared. Half way through our trip, Mother Nature decided to give us a unique experience. Throughout the first week heading north on the Danube, we noticed the water level steadily increasing. Tree trunks along the river banks slowly disappeared under the fast flowing water. Alongside our boat, we watched entire tree trunks race past us like torpedoes to their target. Chairs and tables floated by as though a local IKEA store exploded somewhere along the Danube. Something didn’t look right. One evening, without any inkling that something was amiss, Rik informed us that the next morning we would need to disembark the River Duchess. Due to flooding along the Danube, all river traffic was forbidden beyond Budapest. We would be transported via motor coach to Vienna. Once there, we would embark on the River Empress, a sister ship to the Duchess, for the remainder of the cruise. As soon as the questions subsided, nearly everyone saw this as a unique adventure, a testament to the spirited mindset of river boat cruisers. The bad news was that we’d only have one day in Budapest. The excellent news was that we’d have four days in Vienna, a jewel in the crown of European cities. Aside from Paris, Vienna is my next favorite city. I’m sure there were frantic days and sleepless nights for the staff in order to get our arrangements in place. By not letting us know until every single detail of our transfer was in place, none of us had time to worry. Moving 110 passengers and 220 pieces of luggage proceeded without a hitch. Within three hours we said our sad goodbyes to the staff and crew of the River Duchess and were cheerfully greeting by our new staff and crew of the River Empress. Rik remained with us for the transition between boats. He stayed onboard the River Empress for three more nights while we became acclimated to the new ship and to segue into the arrival of Ann, the new cruise manager. There were twenty of us from the River Duchess who had booked the entire twenty-four day journey. We would continue on for the second half of the cruise as veteran river cruisers. Those who had booked only the first half of the cruise, from Bucharest to Vienna, would disembark after two nights in Vienna as another group of passengers would board for the trip to Amsterdam. As we continued our northbound route, we left behind a once-divided Europe; people struggling to fully understand their role of responsibility while coping with their recent independence. In stark contrast to the mostly wilderness scenery on the lower Danube, every turn on the Rhine offers views of magnificent castles and fortresses, quaint villages and towns accented by the renown vineyards of the Wachau Valley. As a reminder of Germany’s role in WWII, dotting the edge of the river banks are the remains of historic bridges, stone monuments built to celebrate military victories and railroad tunnels designed to look like churches and castles to deter the Allied bombings. Towards the end of the cruise, we were handed cards to fill out with our departure time and destination. To make disembarkation as painless as possible, the staff scheduled taxis for those going to the train station or local hotels and buses to the airport for those with flights home. Twenty-four days on two luxury river boats left me with dozens of new friends and even more incredible experiences. Eventually it was time to say another round of good-byes, exchange email addresses and wipe away tears. For many of us, it was a cruise of a lifetime. I take with me indelible memories – of pedaling my bicycle at dusk along a tree-lined path in the German countryside; sipping a cold, locally brewed beer in an outdoor café in medieval Regensburg; watching the famous Lipizzaner horses at the Spanish Riding School perform to the music of Mozart and Strauss. And onboard…enjoying the sights, sounds and costumes of the many folkloric musicians and performers who entertained us at various ports. Possibly the most unique memory was our invitation to have lunch at a private home in Osijek, Croatia. I am counting the days until my next cruise on the legendary rivers of Europe. It’s an incredible experience. With the River Empress nearly a carbon copy of the Duchess, our entire Uniworld experience was exceptionally wonderful. For those who are tired of the huge crowds, long frustrating queues and blaring announcements on ocean cruises, a relaxing river cruise is the perfect solution. Thank you, Uniworld Boutique River Cruises, for the opportunity to experience and review the River Duchess and River Empress. While this was a sponsored trip, my comments are honest and reflect my cruise experience. Everyone has different tastes and preferences. Transportation to/from the ship in Bucharest and Amsterdam was at my own expense. Thank you very much for leaving your nice comment. Great review Cruise Maven. I loved reading your details about the trip, very well written. Thanks for sharing. We woild like to know how we could contact you about are next trips.